Simon & Schuster, 9781416543343, 707pp. 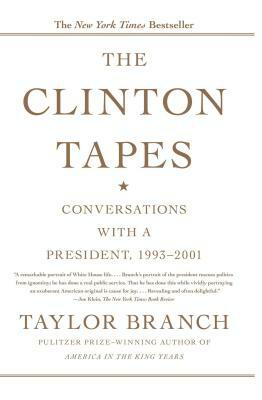 Taylor Branch's groundbreaking book about the modern presidency, The Clinton Tapes, invites readers into private dialogue with a gifted, tormented, resilient president. Here is what President Clinton thought and felt but could not say in public. This book rests upon a secret project, initiated by Clinton, to preserve for future historians an unfiltered record of presidential experience. During his eight years in office, between 1993 and 2001, Clinton answered questions and told stories in the White House, usually late at night. His friend Pulitzer Prize-winning author Taylor Branch recorded seventy-nine of these dialogues to compile a trove of raw information about a presidency as it happened. Clinton drew upon the diary transcripts for his memoir in 2004. Branch recorded his own detailed recollections immediately after each session, covering not only the subjects discussed but also the look and feel of each evening with the president. The text engages Clinton from many angles. Readers hear candid stories, feel buffeting pressures, and weigh vivid descriptions of the White House settings. Branch's firsthand narrative is confessional, unsparing, and personal. The author admits straying at times from his primary role -- to collect raw material for future historians -- because his discussions with Clinton were unpredictable and intense. What should an objective prompter say when the President of the United States seeks advice, argues facts, or lodges complaints against the press? The dynamic relationship that emerges from these interviews is both affectionate and charged, with flashes of anger and humor. President Clinton drives the history, but this story is also about friends. The Clinton Tapes highlights major events of Clinton's two terms, including wars in Bosnia and Kosovo, the failure of health care reform, peace initiatives on three continents, the anti-deficit crusade, and titanic political struggles from Whitewater to American history's second presidential impeachment trial. Along the way, Clinton delivers colorful portraits of countless political figures and world leaders from Nelson Mandela to Pope John Paul II. These unprecedented White House dialogues will become a staple of presidential scholarship. Branch's masterly account opens a new window on a controversial era and Bill Clinton's eventual place among our chief executives.